40 years after Spain’s transition to democracy and over 40 years since the death of General Francisco Franco, at perhaps an unexpected juncture, the country’s new government is taking on a totemic issue – removing the tomb of Franco from his basilica at the Valley of the Fallen. Last Friday week, the Spanish government issued a legal decree to allow for the exhumation of Franco’s remains. Franco’s family have now been given 15 days to choose the site for the dictator’s new resting place, or, the government has said, it will be done for them. Besides this, the PSOE (Socialist Party) government announced it would retrospectively quash Franco-era show trials, which sent many Spaniards’ ancestors to a death by firing squad and an unmarked grave. The decision to remove Franco’s remains – along with those of the far-right Falange’s founder and leader, José Antonio Primo de Rivera – from their current resting place at the Valley of the Fallen, and to turn the site into a centre for reconciliation and historical memory, came surprisingly fast after Pedro Sánchez’s ascension to office in a successful vote of no confidence against Mariano Rajoy’s government in early June. Sánchez’s promise to carry out the removal by the end of the summer, now finally being realised, has however sparked a number of protests while the Spanish Right began an overdue task of reorganising. The largest manifestation of these protests came on the weekend ahead of the 17th and 18th July dates – which mark the anniversary of Franco’s 1936 military coup, and the beginning of the Spanish Civil War – when hundreds of Franco supporters and far-right groups gathered at the Valley to stage a demonstration over the new government’s plans. Beyond the number of people buried there (at over 30,000, the Valley is one of Europe’s largest mass graves), the monument itself is worthy of some consideration. 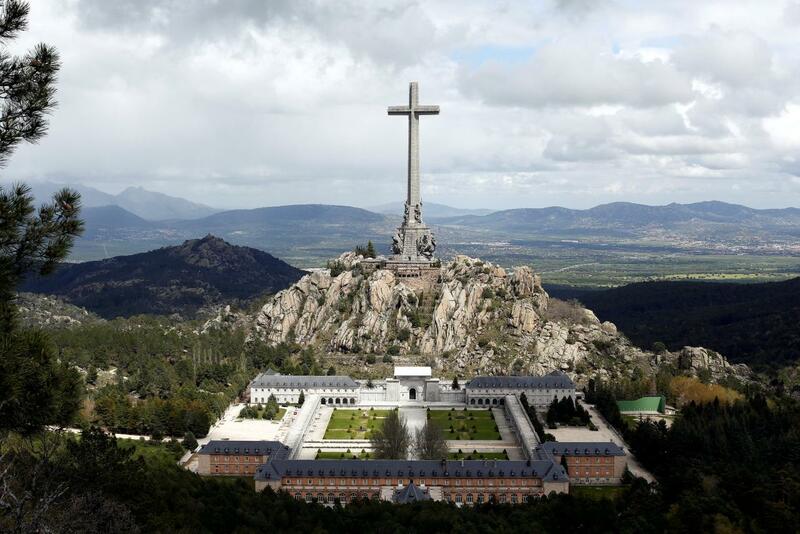 A kind of pyramid to Franco and his fascist regime, the shrine drilled into a mountainside in the Sierra de Guadarrama range, to the north-west of Madrid, is crowned by the tallest stone cross in the world (150m high) and was built with the forced labour of Republican prisoners. As left-wing Spanish journalist Antonio Maestre notes, the mausoleum’s “proximity to El Escorial monastery, the historic resting place of Spanish kings, was no accident” either. Inside stands an alter to Franco next to which Rivera’s tomb also lies, as the only two marked graves there. When you add to this the fact that thousands of graves at the site were filled with the bodies of Republicans without the consent of their families, and that Franco’s own burial at the Valley was consecrated with a state funeral, it becomes difficult to view this as a discrete private resting place, or indeed as something outside of the remit of the Spanish government. In fact, the extent of a previous PP administration’s funding of the Francisco Franco Foundation, whose members regularly lay fresh flowers at the tomb of the dictator, was uncovered as recently as last year. Today the Valley is (to non-Spaniards) more of a tourist site than anything else, with some 250,000 visitors stopping by the monument every year. Complete with a gift shop peddling a Valley souvenir range, tour companies reportedly skirt glaring controversies in their guided trips and explain the site’s significance in little more than a surface-level and inconsistent way. Even at the site of his tomb, it is almost as if Franco did not exist in some ways. But the wounds of Franco’s dictatorship and the brutal posguerra (post-Civil-War) years are still very raw ones in modern Spain. And some of those wounds are only just beginning to be treated now. Like the many cases of Franco-era baby-trafficking – which are only being heard in Spanish courts for the first time this year – the Valley is emblematic of trauma in 20th-century Spain. And as with the baby trials, PP government funding of historical memory issues has been so scarce that most efforts to unearth lost graves have been left to individual families, something which has drawn criticism from the UN and human rights organisations. Another related issue which has re-surfaced this year is the one of state honours, as Podemos has demanded the notorious ‘Billy the Kid’, along with other Franco-era officers accused of torture and killing, be stripped of their decorations and tried for their alleged crimes. As the analysis of prominent Franco-era survivors (like Lidia Falcón) runs, the unprocessed historical pain resulting from the civil war’s legacy today informs what from the outside can seem like petty or short-sighted battles over symbols, which continue to grip Spain as it prepares to go into a highly-charged, Catalonia-oriented autumn cycle. Untouched civil war and Franco-era matters like these ones go right to the heart of Spain’s transition to democracy in the 1970s, a process many critics argue is inadequate and incomplete. In what was literally termed a ‘pact of forgetting’ (‘pacto del olvido’), and codified in the 1977 Amnesty Law which extended amnesty to all Franco’s aides and officials, both the leftist and rightist political forces who drew up modern Spain’s constitution (along with a number of Francoist representatives) resolved not to deal directly with the legacy of the dictatorship. In 2007, Zapatero’s PSOE government attempted to redress this with the Historical Memory Law, which will now have a pair of articles added to it in order to legally safeguard the exhumation. At the time, the legislation was bitterly opposed by the PP and by the Catalan Republican Left Party, in the first instance on the grounds it weakened the political consensus of the transition and needlessly re-opened divisions, and for the latter party because of the precise opposite reason – that it didn’t go far enough. The wide spectrum of Spanish parliamentary formations – many of whose votes this government relied on in June – points to some of the tricky party-political obstacles Sánchez has had to overcome in pushing through his own party’s proposals on the issue. Although most groups support the removal of Franco, few agree on the detail of the project. The PP inevitably opposed his government’s plans – and the ‘symbolic’ Congress vote last year which they flow from – while Ciudadanos object to the use of a legal decree to carry out the exhumation, arguing the use of “emergency measures” is not necessary and that matters more pressing than the one of historical memory require attention. It is believed the government’s wiping of Franco-era show trials, which criminalised figures like Catalonia’s former President Lluís Companys, before sending them to their deaths, was done in part to win support of the Republican Left and PDeCAT groups for the exhumation. Last week, though, Sánchez found himself having to row back on some of his government’s plans for the Valley, all the way from Chile. Now it appears there will be no museum or centre, as initially proposed, and that the Valley will be left simply as a civil war cemetery. The PP’s newly-elected leader Pablo Casado, along with Albert Rivera from Ciudadanos, wasted little time in redoubling their criticism of the plans and trying to push the focus back onto Catalonia and immigration as quickly as possible, before the next political cycle gets underway. On top of this, Podemos have pointed to the “incoherence” between the government’s newly-established Truth Commission and a proposed amendment to Spain’s Official Secrets Law, which could block key information on Francoism and the 1981 right-wing attempted coup coming to light. The difficulties Sánchez is experiencing with these plans underline the uniquely contingent position of his interim administration. Regarding the proposals for the Valley of the Fallen, some still maintain the best approach is, for want of a better expression, to let things lie – and that the monument as it stands would do a greater job of illustrating Franco’s despotic legacy than this removal will. The Franco family have called the removal “an act of retrospective revenge without precedent in the civilised world” and have said they will exhaust “all [possible] legal avenues” to stop the exhumation. Assuming the exhumation does take place, there is also the problem of what to do with Franco’s remains if the family continues to oppose the procedure and do not decide on a new resting place before their 15-day deadline. Sánchez’s government will need to consider this carefully, since they run the risk of creating a new fascist pilgrimage site which supporters could flock to, wherever this may be. If this decision is another example of the post-materialist ‘gesture politics’ Sánchez has been criticised for (initially from sectors of the Spanish Left, but there was a hint of this assessment in Casado’s comments last week), then maybe this has been the most significant symbolic gesture he has made yet as Prime Minister. Though, the criticism gets at something – seemingly obvious but nevertheless – crucial concerning this specific act: and that is that the task of re-building Spanish society is one that goes well beyond these kinds of interventions. An academic consensus and a resulting shared narrative of the past – both of which currently don’t exist in Spain – clearly need to be reached. In schools, Spanish history barely deals with the dictatorship years between 1936 and 1975. And, as Madrid-based journalist James Badcock comments: “If you go to a bookstore in Spain, it is as easy to find a crackpot version of the civil war in which Franco et al were white knights preventing Spain being engulfed by the flames of communism as it is to find a sensible version”. Education of course has to be central to any meaningful progress on the legacy of the Spanish civil war. And, so, accordingly, political parties need to put their collective weight behind an educational programme and a push to make this part of the national curriculum. The PP can not be counted on to do this, since they have never really been able to properly condemn Franco or renounce the party’s ties to its Francoist roots. But with the support of the other groups, it is certainly possible, and it should be the end goal of this ‘truth and reconciliation’ process, which, as Sánchez pointed out last week, must be about closing wounds rather than re-opening them or, worse yet, leaving them to be re-opened in future. Thank you for an informative and interesting discussion. I suggest that most states in which the people of the state believe they live in a democracy are actually in a transition to democracy. For example is the UK actually a full democracy? The USA is an example of how the institutions of democracy actually hold back social progress. Spain could actually be more of a democracy, but still transitioning to democracy, than is the UK which is probably not currently transitioning. Some people say that the UK is an English empire. I have a theory that, “History is the ideological analysis of selected events.” So in Spain we could perhaps have at least as many histories as there are political parties. And the burning issue of Israel and Palestine would be another example of a number of alternative histories. And while those ideologies persist in Spain is reconciliation possible? Of course the UK is de facto the English empire. But there are different narratives, none of which are true. There is a lack of intellectual coherence because the narrative was never agreed. British History has only begun to be written, from the 1990s. Until then there was English History (assumed to be British) and Scottish History, a minority subject even in Scotland. The UK was never a ‘statesmanlike bargain between equals’ (unionist narrative). Scotland entered ‘voluntarily’ into an unequal union. We were not ‘conquered’ (militarily) as many English and some Scots assume, but agreed through act of parliament (under heavy pressure from the Crown). As soon as it was achieved, the English forgot all about us and by and large, never think about us at all. This is probably more of a benefit than a disbenefit. Scots also preferred to think that it hadn’t ever happened. Thanks for this really interesting and informative article. I hadn’t really realised the extent to which Spain wasn’t on the same page as the rest of us as regards the Franco era. It sounds like they have a lot of work to do putting these ghosts to rest. I know very little about Spanish history but I have the impression that the structure of Spain has come about in a more federal way than the UK in that it consisted of various kingdoms of roughly equal size which eventually loosely amalgamated under one Crown; and until the Catalonia crisis I was unaware of the extent to which it was basically federal in structure. The 1978 constitution reflected this, but not to the extent that the Catalans would have liked. By contrast the UK consists of England, which was once seven kingdoms consolidated, subjugated and wholly centralised by the Norman Conquest in 1066, and Wales, which was forcibly annexed by the Norman dynasty soon after, the rump of Ireland which the Normans’ successors only half tamed, and Scotland which held out until 1707 when it was conned into ‘joining’ but still managed to preserve a good deal of its autonomy. I remember one evening at Barajas Airport in Madrid, waiting for a flight to Galicia, which was delayed by one of the most spectacular thunderstorms I have ever experienced, with brilliant flashes of forked lightning and seemingly apocalyptic rolls of thunder. It was like a gothic horror film. And, there on a mountainside flickeringly revealed was the enormous cross, which I subsequently found was atop the Valley of the Fallen. I had not heard of the place before and on undertaking some research the full gothic horror of the place was revealed. During all those years during the 1950s/60s when, as a boy, I was marvelling at the skills of Real Madrid there were slave labour camps in Spain and many of the Republican prisoners were, literally, worked to death on projects such as this. Apart from the tombs of Franco and Prima de Rivera the thousands of other ‘fallen’, their names unrecorded, were all Republicans. Removing the tombs of Franco and de Rivera and having a proper consecration of the other dead should star a proper reexamination of the post Civil War period and its atrocities, which was substantially closed down by the passing of the ‘Historical Memory Law’. Apologies, for not using my full name. I sneezed when I started timing and the involuntary movement of my hand brushed over ‘post comment’! That’s my excuse anyway. I don’t know if there was an idea that if Spain (or other nations like Portugal) joined the EU it would act as a brake against sliding back into dictatorship. If the EU holds secrets on things like its internal investigations and evaluations of Spanish compliance with minimal EU democratic and rule-of-law requirements, and British citizens had access to these secrets as EU officials or representatives, then in a Brexit with no secret-keeping agreement would these UK citizens be legally free to divulge these secrets? Or would the UK government be effectively as able to blackmail EU countries like Spain in the same way as those governments would be released to blackmail the UK? I ask these questions because the circumstances seem to lack exact precedent and politics commonly appears to be conducted on the basis of information warfare. Franco was not a part of the coup at this time, he was certainly not its leader. Franco was certainly part of the coup during those dates. He announced the Nationalist manifesto in a broadcast from the Canary Islands on 18th July 1936, as the uprising was beginning, and then flew to the Spanish protectorate in Morocco the next day to take control of troops there, as well as securing support from Nazi Germany and Mussolini’s Italy, before establishing his base of operations in Seville the following month. Although he wasn’t physically present in mainland Spain during 17th and 18th July, and though he had apparently distanced himself from plotting in the prior months, to say that he wasn’t part of the coup is wrong. But it is true that Franco wasn’t made leader of the new Nationalist regime in Spain until October 1936, and that the coup was carried out by a number of right-wing groups (e.g. Carlists) across Spain, not just a unitary force led by Franco. Maybe saying “the Nationalists’ 1936 military” coup instead of “Franco’s military coup” is more accurate in this sense, and helps clarify things. Have requested that change, along with a few other small things that crept in to the article. Thanks for your comment and for pointing that out. Franco was certainly part of the coup during these dates. After having gained the territory, Franco announced the Nationalist manifesto in a broadcast from the Canary Islands on 18th July while the uprising began in the north-west of Spain. The following day, he flew to the Spanish protectorate in Morocco to take charge of the troops there, and shortly after to secure support from Nazi Germany and from Mussolini’s Italy. Although he was not in mainland Spain on 17th-18th July, and although he was not named leader of the new Nationalist regime until 1st October 1936, to say he was not a part of the coup at this stage is wrong. It is true, though, that Franco was not the only commander leading the coups taking place in July 1936 – what is remembered as ‘the 1936 coup’ was carried out in a number of uprisings led by other military generals (Mola, Llano etc.) and other right-wing groups (e.g. the Carlists). Perhaps “the Nationalists’ 1936 coup” is clearer and than “Franco’s 1936 coup”. Have requested that change now. Thanks for you comment and thanks for pointing that out.